If you’re a fan of the video game DOOM, you’re going to love Crazy Robots’ game app, The Infinity Project. It boasts an amazingly similar plotline: it’s the future (2248 AD), and Earth is at war with an alien race called the Talons. Commander Ethan Avery (that’s you) is sent to investigate Infinity Station, a top-secret R&D space facility that has lost all contact with Earth. To explore the station, you must unlock sections by finding keys, and figure out what happened in Infinity Station. Also? It’s a first-person shooter, baby. Watch out for monsters! Move through the station by using the joystick in the bottom left corner; drag anywhere on the screen to look around, or turn the Commander around (movement sensitivity can be adjusted in Options). To fire your weapon, tap the button on the bottom right. The Fire Button’s position can be customized, as well. Make sure you have enough ammo by keeping an eye on the upper right corner. Tap the indicator once to reload, or twice to change weapons. The Health Bar is found on the top left corner, with the GPS map right under it; to mark your current position in the field, tap the GPS. There are three difficulty levels: Easy, Normal, and Suicide. The game keeps track of your kills…and your deaths. Once you kill something, search it for ammo, log books, and pass codes. Approach computer terminals and desks, too, for the same and hints as to what went down. And if you’re squeamish, there’s even an option to turn off the blood effects. Best of all…you get to choose your armor color! Well, okay, and shoot aliens. For hints on how to pass levels, just go to the developers website, because if you’re anything like me, you’ll get tired of walking around the same halls without finding anything of use. The Infinitely Project is all-around flat-out amazing. The 3D graphics is definitely the star of the show; so gorgeously rendered, it’s quite feasible that you will immerse yourself wholly into this world. The soundtrack is atmospheric and even haunting at times, and whatever sound effects there are are utterly suitable. This game is way intense, and I can’t believe it’s available for only $3.99. The Infinity Project is one of the best first-person shooter games to ever cross my Apple Device, and I can’t imagine how much better it can get. 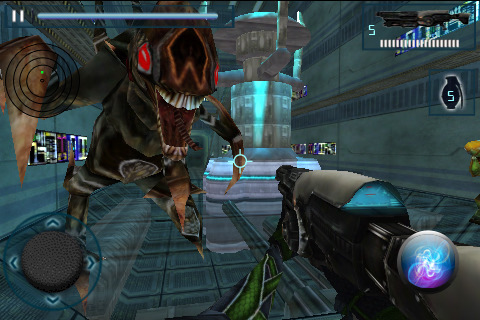 AppSafari review of The Infinity Project was written by Julie Guan on July 8th, 2010 and categorized under Action, Adventure, App Store, Featured, First Person Shooter, Fun, Games. Page viewed 6288 times, 2 so far today. Need help on using these apps? Please read the Help Page. The developer has been kind enough to provide our readers with some promo codes for this game. Its well worth the money.